3 bedroomed house with 3 bathrooms. Idyllically situated in Cala Deia with cliff top views and direct access to a crystal clear bay and the No1 restaurant in the Med where you can enjoy fresh fish and chilled wine at the waters edge as featured in The Night Manager. The Finca is a much loved family home suitable for people who prefer nature to night-life. The main house is compact with 2 bedrooms and 2 bathrooms, beautifully equipped with three terraces and breathtaking views of the bay. A perfect base for hiking, kayaking, swimming, sightseeing or just relaxing!! Recently the property has been upgraded with new air-conditioning, a new satellite dish for Freeview, an electronic awning over the main terrace/outside dining area, some new furniture and beds, improved BBQ, redecoration and inclusion of an ipod dock. The third bedroom: The light and airy studio (double bed and en suite) below the main terrace with separate access is suitable for 2 more people with also wonderful sea views. This means the house is perfect for a total of 6 persons. Private, romantic, unique and just spectacular! sea views, direct access to the sea, privileged location and it's own private path to THAT restaurant. Important! Due to the steps and cliff side position of the house it is not suitable for people with mobility problems or vertigo. The property is accessed via a small road with a turning space and room to park one small to medium car. NB. The larger double bedroom and bathroom is self contained and accessed via outside steps. We loved our stay in Deia. The house was clean, comfortable, and the perfect size for our family of 4. We loved spending time out on the balcony sipping wine and enjoying the gorgeous view. The quick walk down to Cala Deia and Cas Patro March was perfect. We felt like we had our own little private slice of Mallorca for 5 days. With the road to the house being so small and remote, we really did feel like we were away from it all! We would definitely stay here again! We spend a few weeks on Mallorca in 3 different properties and loved them all. This was amazing by beeing so close to the sea. The house is small but very well equiped with nice furniture and really clean. Unfortunately restaurants at the beach closed during the winter but still the weather was great and had nice moring walks down to the sea. A small rental car was recomended by the house manager and glad we did! the roads along the coast are indeed narrow. We cooked a lot and stayed in most evenings by the log fire relaxing and reading a book or watching tv. Deia and Valldemossa are very nice little villages worth a morning visit. Banyalbufar and Estellencs have also been a nice Discovery. We highly recomend this hidden Paradise! The most beautiful view in all of Mallorca!! It was my first stay here in Deia and i was blown away with its beauty, the villa is very private with the most incredible view of the sea and the mountains, it has everything you could need, i couldn't recommend this place enough and i cant wait to come back again next year! Thank you! Highly recommend this beautiful place, it was just two of us and we felt it had plenty of room. The washer and dryer work great, so does the dishwasher (a rarity in most smaller European ere is an outdoor bbq but we didn't use it. The restaurant directly down at the cove via a private path is delicious. We ate there many times and mixed it up with a few stay at home easy meals and the rest in Deia, lots of really great places to wine and dine! We stayed here for a week at Easter and it was a truly magical place to stay, whatever the weather (and it was definitely very 'mixed' during our stay!) The house was perfect and the views even more so - would definitely recommend to anyone seeking an unspoiled, relaxing escape. Talk about ' a room with a view', this is the 'house with a view' and every view is magical! The house itself is really pretty and comfortable with loads of character and has everything that you could want or need and the showers were great (the pictures don't do it justice!). The house is perched on a cliff overlooking the sea so you wake up to the gentle sound of the sea on the rocks below and the beach with a fantastic fish restaurant is just a one minute down a private path. The village of Deia is stunning with some great restaurants; we liked Sebastian's and the tapas restaurant the best. It was the best holiday we've had in ages! We didn't want to leave and will be booking again next year. Cala Deia has a waterside restaurant and snack bar. It is just a 25 minute walk or 5 minutes by car from the picturesque village of Deia which has many restaurants, bars, a general store, chemist and ATM. From the main road there is steep climb through winding streets to the church at the top of the village. It is in this churchyard that the poet Robert Graves is remembered with a simple headstone. 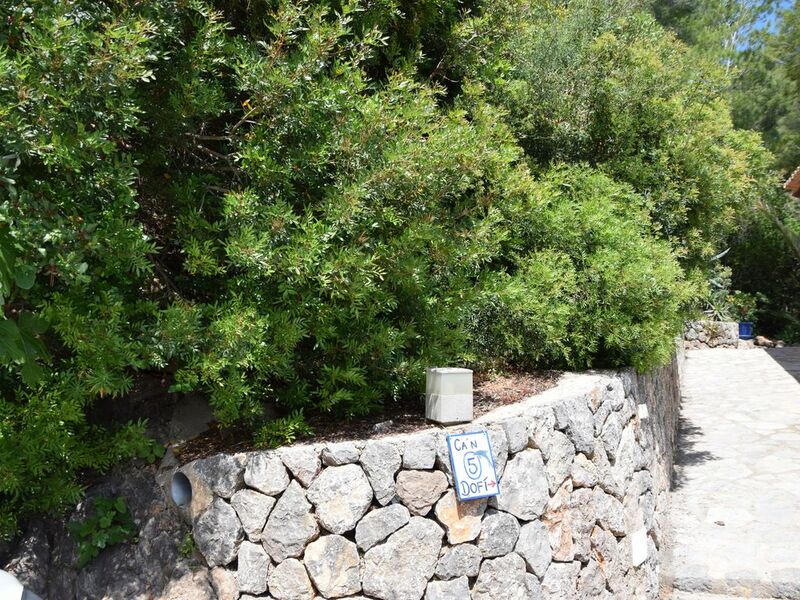 From Deia it is possible to walk to the town of Soller (approx 4 hours) but for the less energetic there is a bus, which passes through the town 3 or 4 times a day. Soller is surrounded by mountains and orange groves and is famous for its mountain train that cuts up through the Serra de Tramuntana to Palma. Sitting in the shady square in front of the church next to the bustling market Soller seems a million miles away from the more popular tourist destinations. An old fashioned tram links Soller to Porto Soller where there is a clean sandy beach and numerous fish restaurants. Deposit of 50% required to confirm bookings by bank transfer. Special deals for couples.